North Wales residents battling to redevelop a cinema closed three years ago could end up running the facility. 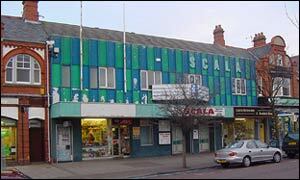 The Scala in Prestatyn was shut because of structural damage to the building. Local people have now been told a community-based organisation will be put in charge of it once it has been revamped. New proposals to redevelop the cinema - costing �2.4m - include creating an arts centre, a cafe bar and improved access for the disabled. Sandra Pitt, from the Scala Advisory Group, said local people would benefit from having direct responsibility for the cinema. "I don't care who manages it as long as we get it but it would be nice because we'd have more say on how it could be run," she said. Following a study commissioned by Denbighshire County Council, proposals for the site include a 150-seat cinema and a second part-time cinema. The plans also include a visual arts gallery and several general purpose rooms for the use by the community. Mrs Pitt said residents have suffered as a direct result of the Scala's closure. "We need the cinema because it was our community centre as much as a cinema. "The schools and drama groups put on plays there and it was virtually the home of our community. "We are totally lost without it," she added. The Scala Advisory Group has agreed to set up a charitable company to manage and operate the proposed new cinema. Councillor Mike German said the local authority believe residents should be involved in the running of the facility. "It is important that the new Scala is managed by, and for, local people." A second, more detailed study into the renovation proposals, has been commissioned and will cost in the region of �50,000. The study will look at how much money the Scala would be expected to make upon opening. Denbighshire county council has pledged funds for the study but is awaiting the result of applications for match funding from the Arts Council and Welsh Development Agency. The building housing the Scala cinema was opened in 1900 as a town hall and was converted into a picture house 13 years later. It lost its old fascia in the 1960s, when the blue facade was added.